Classic preparation: pipe and place disk of brown sugar crust on top, bake as normal. Cream butter and sugar together. Next, add flour and sheet to 2 millimeters thick. Infuse milk with zests and cinnamon for one hour. Strain milk and make similar to pastry cream. Cool and put sugar on cream and caramelize. Blend caramelized cream in mixer and add gelatin. Fold in whipped cream. Blanch lemons for one hour. Cook with sugar to confit. Caramelize sugar and glucose. Deglaze with salt and cream. Halve pâte à choux. Place lemon confit in bottom. Pipe Catalana Mousse on top, leaving a space in the middle. Place caramel sauce in the empty space. 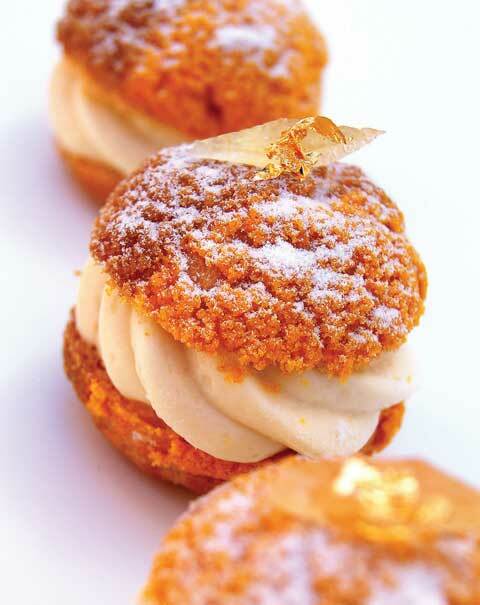 Place other half of choux back on top.